Profile cutting of all metals. Hot and cold plate rolling. 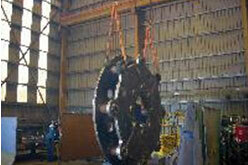 Guillotine and plate presses - 3780 (8ft). Hard face and reclamation work. Welding:- (GMAW or MIG), (GTAW or TIG), MMAW, FCAW & OXY. Low current (sheet work) and high current high duty cycle machines on hand. Two overhead travelling cranes 40 tonne total capacity (4 hooks) (9.2m clear). 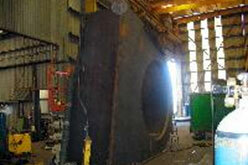 500 tonne capacity Slipway at the rear of the boiler shop. Ability to completely open rear of factory to allow movement of large projects. 465 Square meters of fabrication shop floor space. 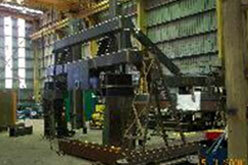 Special purpose machine frame being fabricated. Machine base plate. Ready to be moved to the machine shop.